Whether you delight in the challenge of a strenuous hike to the crest of a mountain or prefer to sit quietly and watch the sun set, Great Smoky Mountains National Park offers a myriad of activities for you to enjoy. The hardest part may be choosing which auto tour, trail, waterfall, overlook, or historic area to explore! Auto Touring - An auto tour of the park offers a chance to see panoramic vistas, rushing mountain streams, weathered historic buildings, and majestic forests stretching to the horizon. Inexpensive booklets are available to serve as your personal tour guides along many park roads. Bicycling - Ride through Cades Cove on a misty summer morning for a truly memorable way to experience the park. Camping - Escape into the Smokies wilderness for a backpacking adventure or opt for a tamer excursion in one of the park's developed campgrounds. Fishing - Anglers can match their skills against wily brook, brown, and rainbow trout on over 700 miles of fishable streams in the park. Hiking - Choose from over 800 miles of trails ranging from quiet walkways to multi-day backpacking treks through the backcountry. Historic Buildings - The park has one of the best collections of log buildings in the eastern United States. Nearly 80 historic structures—homes, barns, churches, schools, and grist mills—have been preserved in the park. Horseback Riding - The park has hundreds of miles of horse trails and five drive-in horse camps. If you don't own a horse, four rental stables provide mounts and guides. Picnicking - Craving hotdogs, potato salad, water melon... and ants? There are eleven picnic areas to choose from in the park—many have pavilions that can be reserved in advance. Waterfalls - Waterfalls can be found on nearly every river and stream in the park. Here's your guide to some of the best. Wildflowers - Great Smoky Mountains National park is known as the "wildflower national park." You can find blooming plants year-round here, but spring and summer are renown for spectacular displays of wildflowers along roads and trails. Wildlife Viewing - Hoping to see an elk, white-tailed deer, or black bear? Read some tips to improve your chances of spotting animals during your visit to the park. 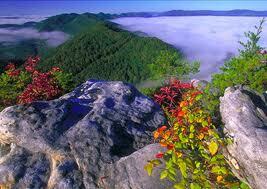 For more information, visit The Great Smoky Mountain National Park's Website!